Here's an interactive glossary 'template' I put together after getting a lot of questions from clients during training sessions regarding the limited functionality of the Storyline player glossary. Check out the screencast on how to use and adapt it. * Update * I've launched a new blog to centralize my shares and posts in a single spot. For the latest versions of the .story files (now Storyline 1 and Storyline 2 files available) head to my blog and download the file you need. Love to hear your thoughts, comments and improvements! This is really nice! Thanks Jeff! This is great! Thank you so much. The explanatory video is a terrific help. Thats great and helpful! Thanks jeff for the contribution. You've done really a nice work but I'm having a problem here, when I tried to click an alphabate on lightbox slide for its perticular terms it doesn't take me to the particulare lightbox slide of the alphabate. For example if I'am visiting the lightbox slide of Alphabate "A" and I wish to visit the slide of alphabate "B" from the same slide, It doesn't allows me to do so. This is a great template. I am having problems with updating the Master Slide. When I make changes to the Master, its not reflected in all of the slides. That's odd Helena. What's happening, or not happening? Can you describe step by step? 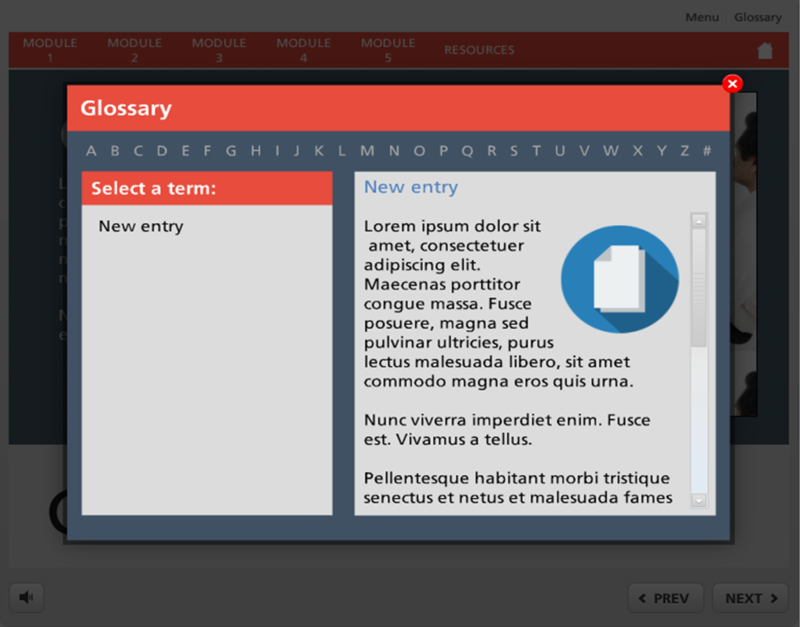 This is a great (and blindingly obvious) solution to the basic glossary implementation in Storyline, so thank you very much for sharing. I plan to adapt this to our own corporate template this week. It's also worth noting that this glossary solution allows for a much more feature rich glossary that can include images, audio or video. A great idea and thanks again for sharing! Articulate, take note for a forthcoming update! Glad you found this helpful Rob. Be sure to share your thoughts with our product development team here. Thanks Rob. Glad it's useful to you! I second that motion to the development team. Just thought I'd add that I took your template a step further, Jeff, and fixed a problem I encountered. The glossary we use in my company is quite a large one and I was very quickly coming up against a problem with the "Select a Term" area. When the number of terms overflowed the space given, I used the scrolling text function but then this rendered the hotspots useless as they wouldn't scroll with the text. The blindingly obvious solution, after racking my brains for an hour or two, was to use the hyperlink function on the text of each term. This way, I can put as many terms in that area, using the scrolling function where necessary, and then simply highlight each term, right click and select 'Hyperlink...' and then change the trigger action from 'Jump to URL' to 'Show Layer'. I also added a marker on each slide to show which letter is currently selected. Once I've got the project finished, I'll try and post an unbranded version for you to try. Awesome Rob, would love to see the result! Thanks for this Jeff, I just downloaded to adapt and use in one of my projects, you saved me a lot of work! Cool! It's awesome to see this 'old thing' is still so very popular. Would love to see the result Veronica! This thread is a bit dated, but I took a peek at Jeff's blog post and it seems everything is working as expected. Hope that helps and you are certainly welcome to reach out to the user directly via the 'Contact Me' option on the user profile if needed. Would LOVE to use this glossary for a training that is including over 100 abbreviations... I just can't access the file/blog due to firewall at work. Any chance it can be posted here? "This is a great (and blindingly obvious) solution to the basic glos..."